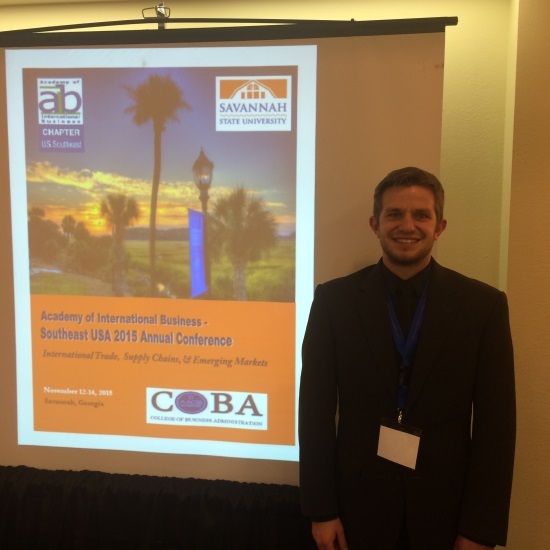 Jack C. Massey College of Business alumnus John Sharpe recently presented a paper, “Economic Growth in Post-Soviet States – The Role of the Great Recession” at the Academy of International Business (AIB), Southeast USA Chapter Annual Conference Nov. 12-14. The paper was co-authored by current Belmont student Joonas Bask and alumni Jacob DeVries and Kurtis Gibson. The AIB US Southeast chapter is one of the largest and most active worldwide chapters of the Academy of International Business, providing participants with opportunities to present their work in a collegial setting, obtain and provide constructive feedback and interact with world class scholars, speakers, panelists and keynoters. In their research, the authors attempted to study and explore the economic growth experienced by post-Soviet states after the fall of the Soviet Union and the role, if any, played by the Great Recession in comparison to countries not previously a part of the Soviet Union. By identifying the structural changes in both the country’s economic and political institutions, the authors examined the relationship between economic growth and pertinent variables influencing growth in transitioning economies. Compared to non-transition economies, they found that the post-Soviet states had lower economic growth. Sharpe presented the paper during a session comprised of presenters fro many universities. He is currently completing his master’s in economics at University of Texas-Austin and will be enrolling in an economics doctoral program in fall 2016. The paper was part of an assignment in the spring 2015 Economic Growth and Development class taught by Assistant Professor of Economics Dr. Colin Cannonier.